Dogs love toys and treats. Now they can have both at once! 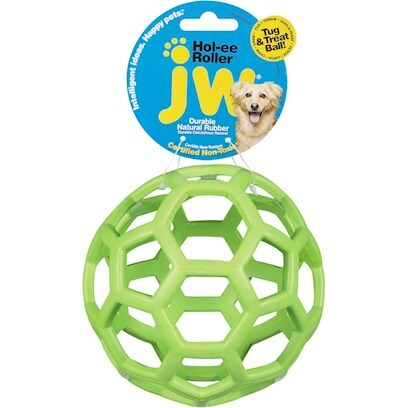 The Hol-ee Treat Ball is a unique pet toy that can stand up to even the most rigorous chewer. Put your dog's favorite treat (pig's ears work well) in the rubber ball and watch them make the most of it. The soft rubber texture feels great in your pet's mouth and it has holes that offer grip for pets to grab onto. This ball is offered in an assortment of colors; we'll pick one for you so you'll be surprised! No known side effects. Always supervise the pet when playing with any toy. Insert treat through any of the holes in the ball. Make sure treat is big enough to stay in.